Cleaning out the freezer always seems like a treasure hunt!! Or should I say an adventure…? Would adventure make you feel better? Treasure implies finding something fantastic rather than the only-god-knows-how-old bananas you’ve pulled out of the back. Or the sticky neon blue and orange mess you have to clean up from busted Pop-Ices. Or frost bitten ground beef that you’re SURE you just bought a few weeks ago. None-the-less, sometimes cleaning out that frozen garbage disposal can yield some great things! Like a bag of frozen cranberries that you were smart enough to wash and freeze at their prime, or black berries, blueberries even rhubarb! I tell ya, sometimes… I’m a pretty smart cookie! 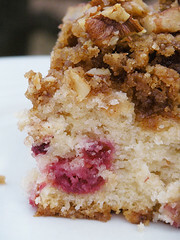 And if you are a smart cookie and tucked away some cranberries, you should be an even smarter cookie and make this coffee cake. It’s divine. It’s day 13 of my Christmas baking Extravaganza!! And cranberries are quintessential on my holiday table. 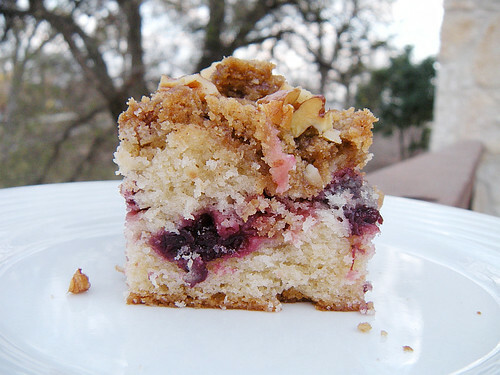 And this is such a lovely coffee cake. 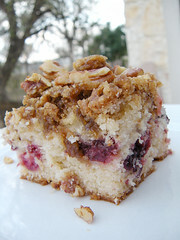 Fluffy, tender, not too sweet cake bursting with plump red berries and topped with a clinically insane amount of pecan crumble. Yep, it’s pretty much perfect!! Sift together flour, baking powder and salt into a medium bowl. Combine butter and sugars in a large mixing bowl and beat with an electric mixer at medium-high speed until pale and fluffy, about 3 to 5 minutes. Beat in eggs one at a time, beating well after each addition, then beat in vanilla extract. Reduce speed to low and add flour mixture and sour cream mixture in alternate batches, beginning and ending with the flour mixture, and mixing until just incorporated. Fold in cranberries. Spoon batter into baking dish and spread evenly. 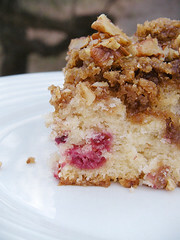 For the topping, place the flour, brown sugar, nuts, cinnamon and oats in a large bowl and stir well with a wooden spoon. Work the butter into the mixture with your fingertips until evenly distributed. Take two full handful of the topping and spread it over the cake batter. Use a knife to swirl the topping into the batter. No need to massacre it, just a few swirls and you’re good to go. Spread the rest of the topping evenly over the cranberry cake batter. Shipping Safe: NO. This is a make and share treat. Make this for your family on a coooold morning. 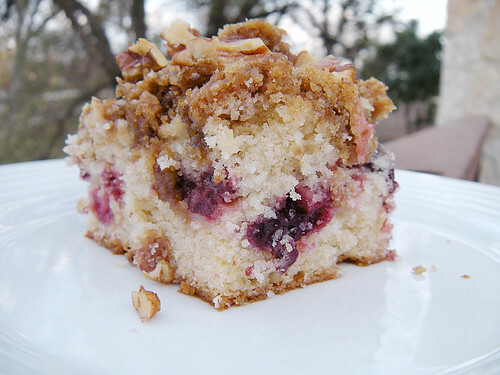 That looks like a great coffee cake! I seriously feel like I don’t freeze very much stuff and somehow it’s always packed.